It has been a long time since we published Lenore’s Natural Cuisine e-newsletter. 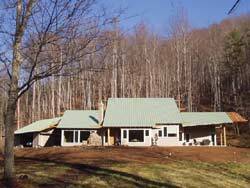 We are still here, but have been working exhaustively on our new cooking school and home near Asheville, North Carolina. Our on-the-road and RV lifestyle is a memory now, since we have finally moved into the new house. This fall, we hosted several solar house tours as we were completing construction. They were a great success with over 200 people coming to learn about sustainable solar and energy saving features. We really appreciate our great builder, Doug Clark, and architect, Chris Larson, for crafting our artistic retreat. A more extensive, information packed e-newsletter will be coming in the new year along with a class announcement and dates for an open house. We are very blessed, and by this experience know that it is possible to make dreams come true.